The global forensic technology market was estimated to be $11.26 billion in 2016 and is expected to grow over $19.25 billion in 2022 at a CAGR of 9.35% through the forecast period. The global forensic technology market has a high potential in future owing to the rising demand for innovation in forensic technologies in various applications and sectors. With the rising penetration rate of cybercrime on a global scale, there has been an increasing need of forensic advancements in few regions, such as Latin America, Middle East, France, Poland and others. The global forensic technology market is expected to grow over $19.26 billion with an anticipated single digit CAGR of 9.35% through the forecast period. The increasing concern of cyber threats and other illicit activities taking place majorly among the private organizations, has led to an advancement of forensic technologies in the global market with an aim to tackle cybercrime. The development in the market is accredited to the rapid adoption of forensic technologies and equipment such as DNA sequences, magnetic fingerprinting, integrated ballistic systems and others. The report comprises of the different segments within the global forensic technology market, including market breakdown by the types, application, and different geographical areas. Herein the revenue generated from the major forensic technology types namely: digital forensics, ballistic forensic and DNA testing; and within the application type, namely: law enforcements, enterprise, healthcare and others, is tracked to calculate the overall market size. While highlighting the key driving and restraining forces for this market, the report also provides a detailed summary of the forensic technology market. It also includes the key participants involved in the industry at the relevant sections. 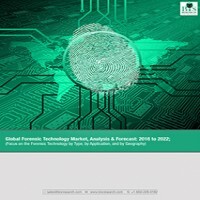 • What are the major factors challenging the growth of global forensic technology market and how can they be addressed through the forecast period? • Which region will lead the global forensic technology market by the end of the forecast period? • What are the prevalent forensic types and what is the market size for each of them? The report puts special emphasis on the market share of the services provided in forensic technology market, owing to the changing paradigms in the industry. The most often used strategy for developing a better hold on to the market has been through the product launches. Moreover, the company profile section highlights significant information about the key companies involved along with their financial positions, key strategies & developmental activities of recent years. Further, the report includes an exhaustive analysis of the geographical split into North America, Europe, Asia-Pacific (APAC), and Rest of the World (R.O.W.). Each geography details the individual push and pull forces in addition to the key players from that region. The prominent players operating in the global forensic technology market include 3M Cogent, Thermo Fisher Scientific, Micro Systemation, Agile Technologies and others. With an aim to sustain within the security industry, new technologies and services are being implemented by private companies as well as the law enforcement agencies for the constant assessment of data related risks to which they are exposed. A wide range of systems are used by today’s leading forensic organizations, enabling them to create, send, search and store data with an aim to efficiently automate the business operations. Hence, there is a need to manage and analyze the data in response to litigation, investigation or regulatory request. These technologies are also aimed in providing assisting to the forensic examiners in developing quick and efficient action plan pertaining to fraudulent and illicit activities. Such responsive measures lead to significant enhancement of the acceptability of the technologies that can tackle cybercrimes, globally. Moreover, these technologies are also aimed at providing a structured examination of data in the court of law as evidence. Almost on daily basis the headlines are made pertaining to the cyber-attacks on the information systems, both by the internal as well as the external perpetrators and fraudulent activities using tools related to electronic data processing. However, with the diversified use of digital technologies such as computers or mobile devices, especially in the field of white collar crimes, there has been an increase in the demand among the private companies for generating new forensic technologies in the market to tackle cyber related threats. Forensics is an application for science consisting of methodologies and techniques used majorly by the governmental agencies and the private companies to tackle cyber threats and to identify facts from the cases to be presented during the court of law. The forensic technologies provide with an efficient identification, interpretation and assessment of substantial evidence gathered from the crime scenes. The demand for the forensic technology is further pushed by prominent players within the respective areas of forensics companies such as 3M, LGC Group, Thermo Fisher Scientific, Micro Systemation and others. With the rise in the global rate of cybercrimes, the demand for development of new forensic technologies and solutions has been a major factor for the forensic companies to prioritize the usage of digital devices. The global forensic technology market was estimated to be $11.26 billion in 2016 and is expected to grow over $19.25 billion in 2022 at a CAGR of 9.35% through the forecast period. The global forensic technology market has a high potential in future owing to the rising demand for innovation in forensic technologies in various applications and sectors. The forensic technology market is expected to progress at a significant rate since the users belong to a diversified application portfolio ranging from law enforcement to healthcare. Reduction in backlogs, increase in the efficiency and value of forensic technologies and others are some of the factors responsible for the growth of this market. However, the market consists of certain challenges as well which are inhibiting the overall growth for the market, such as lack of awareness, non-uniformed legal regulations, expensive nature of the technologies and others. The global forensic technology market is deemed to have evolved through several advancements not only in the field of digital forensics, but also in the areas of ballistics and DNA testing. DNA testing segment holds immense potential in the global market due to the increasing dependence of law enforcement agencies on the same. The DNA testing technology dominated the market in 2016, due to the increasing rate of cybercrimes. The digital forensic technologies is deemed to be the fastest growing market due to the adaption on a global scale. The dynamics of the forensic industry have changed profoundly, owing to the ongoing innovations and advancements in the forensic technology market. The major applications include law enforcement, enterprise, healthcare and others, that have become promising beneficiaries of forensic technology market, making it an indispensable tool to ensure both personal and public safety. The enterprise application continues to be the dominating application, due to a wide range of acceptance of new technologies and solutions by the private companies. Nevertheless, the proliferation of forensic technologies in the market can be due to the law enforcement agencies as they are aimed to provide forensic services and consulting solutions to the private companies and the government entities as well. The increasing trend and adoption of new forensic technology among various geographical regions has led to decline in the number of cyber threats in the global market. The forensic technology market holds a prominent share in various countries, out of which the North American region currently dominates the market due to the presence of renowned companies such as 3M Cogent and Thermo Fisher Scientific that have introduced new forensic technologies in North American region, the market holds a relatively high share. The APAC region on the other hand is deemed to be the fastest growing market, due to the rising rate of cybercrime. The competitive landscape for the forensic technology market demonstrates an inclination towards companies adopting strategies such as partnerships & collaborations, and business expansion, among others. The high growth potential and rapidly emerging forensic technologies are attracting various investors. Few of the key players in the industry include 3M, LGC Group, Thermo Fisher Scientific, Micro Systemation and others.